Seeking Symbiosis: Linking Art to Science. Read more. ENVS graduate student, Juniper Harrower is on a mission to save the Joshua Tree. Working from a grant funded by the Joshua Tree National Park Association, Harrower's research examines the impacts of climate change on Joshua trees and their symbiotic fungi. 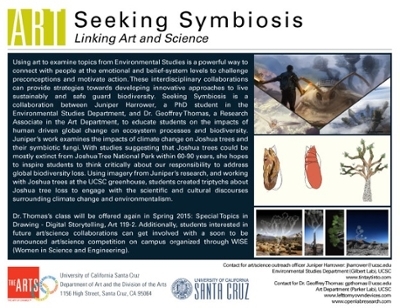 Seeking Symbiosis, the art show, is a collaboration between Juniper Harrower, a PhD student in the Environmental Studies Department, and Dr. Geoffrey Thomas, a Research Associate in the Art Department. It seeks to educate students on the impacts of human driven global change on ecosystem processes and biodiversity via the course Thomas teaches entitled, "Special Topics in Drawing - Digital Storytelling, Art 119." The triptychs are in the north hallways of the ISB through the end of spring quarter. The research and work was featured in the Santa Cruz Sentinel at the end of fall quarter. Read more. With studies suggesting that Joshua trees could be mostly extinct from Joshua Tree National Park within 60-90 years, Harrower hopes to inspire students to think critically about our responsibility to address global biodiversity loss. Using imagery from her research, and working with Joshua trees at the UCSC greenhouse, students created triptychs about Joshua tree loss to engage with the scientific and cultural discourses surrounding climate change and environmentalism. The duo will co-present their work (related to art/science collaborations) at the Social Fiction Conference this year on March 7th. They also plan to create an educational mobile app and short animations from the sketches within the next year. Says Harrower: "Using art to examine topics from Environmental Studies is a powerful way to connect with people at the emotional and belief-system levels to challenge preconceptions and motivate action. These interdisciplinary collaborations can provide strategies towards developing innovative approaches to live sustainably and safe guard biodiversity." Dr. Thomas’s class will be offered again in Spring 2015: Special Topics in Drawing - Digital Storytelling, Art 119-2. Additionally, students interested in future art/science collaborations can get involved with a soon to be announced art/science competition on campus organized through WISE (Women in Science and Engineering). Contact Art/Science Outreach Officer Harrower at jharrower@ucsc.edu for details on that competition as they are released.